With each new season, I get the pleasure of hearing about the Wolverine resurgence, how this will be the year they’ll run roughshod over the Big Ten and the Spartans — and then get to watch Michigan’s season fall apart following a loss at the hands of “non-rival” Michigan State. Each season, I get to hear about Denard Robinson’s Heisman candidacy before Michigan has played a game, how the sophomore, then junior, now senior quarterback will shatter every NCAA Division-I record en route to New York for the trophy presentation. And each year, Robinson blows up in spectacular fashion — though this season’s fall from grace was my personal favorite, when he threw four interceptions on four straight passing attempts against Notre Dame. But please, tell me again how “Shoelace” torched an 0-6 Massachusetts team fresh from Division II for 397 total yards and four touchdowns. That impresses me. There are Michigan State students that believe this is how the world works. This is comical in its lack of historical context. Some time in the last 5 years, Michigan went from a program so dominant over its in-state rival that Mike Hart calling MSU "little brother" became a relevant meme and talking point for the media and both programs, to a team that's known as the Big Ten's Wile E. Coyote, hatching elaborate plans that go hilariously awry. There might be some truth to that perception. Michigan students rushed the field after eeking by an unranked 4-3 Michigan State team. I understand the reasoning: no undergrads have experienced the joy of beating the Spartans before, but Act Like You've Been There Before is an obligation, not a suggestion for haughty Michigan fans. We're the worst. But righting the ship was always Brady Hoke's goal. You get the impression that one of the reasons Hoke would have walked to Michigan from San Diego is that he was pained by Michigan's free fall. In 20 games at the helm of the Maize and Blue, Brady Hoke is 16-4, undefeated at home, holds wins over Michigan's two primary rivals, and has a BCS bowl win. With Saturday's win over Michigan State, winning a Big Ten championship remains the only hurdle left for Brady Hoke's Michigan to leap. This team is not without faults or free of concerns (notably, Al Borges' continued indifference to winning games or even picking up first downs), but it's hard not to feel like this team is being curated expertly by Hoke. With every new accomplishment, victory, and high-ranked recruit, Michigan inches closer to the program everyone fears instead of the one that keeps running into the tunnel painted onto the side of a mountain. Michigan threw the ball on only 7 of 26 first downs, and MSU knew it. Michigan averaged 8.47 yards to go on second down, largely because Borges kept running directly into the face of Michigan State blitzes. This was apparent to everyone watching the game, notably Pat Narduzzi who was licking his chops as Michigan continued to get behind the chains early. Look at where Michigan State's safties are lined up: seven yards (seven!!!!) from the line of scrimmage. Michigan tested the MSU defense vertically only once or twice the entire game. 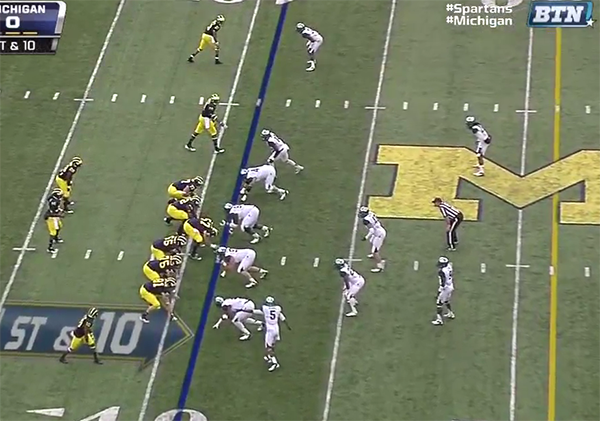 They also rarely used play action, so when Michigan showed run, they were running into a box with 9 players in it. Michigan's offensive structure/scheme against this defense was incoherent. Le'Veon Bell: Still not terrifying. Bell could only muster 68 yards on 26 carries (2.8 YPC) with a long of 8 yards. His game is simply to run into the nearest defender and try to carry him four yards downfield. With players like Jake Ryan laying the lumber on Bell and not Boise State's undersized linebackers, that play style becomes a lot less intimidating (and effective). His offensive line clearly couldn't get a lot of push in this game, but Bell was never able to outrun Michigan defenders to get into space or make something out of nothing. He's one dimensional and Michigan exploited that in this game. Andrew Maxwell is not a very good QB. If this were his freshman or sophomore year, you could make excuses for his performances this season, but he's a junior without much upside. Against Michigan he completed 61% of his passes (his second highest completion percentage this season; against Central Michigan he completed 64.5%) but only averaged 5.64 YPA. His interception was bad and was largely responsible for Michigan winning the game. Raise your hand if before the game, you thought Drew Dileo, Matt Wile, and Brendan Gibbons would be the most important players in this game. No one? Really? Wile finally delivered on the promise of being a big-legged field goal kicker. In case you were wondering, yes that was Wile's first field goal attempt in a Michigan uniform. 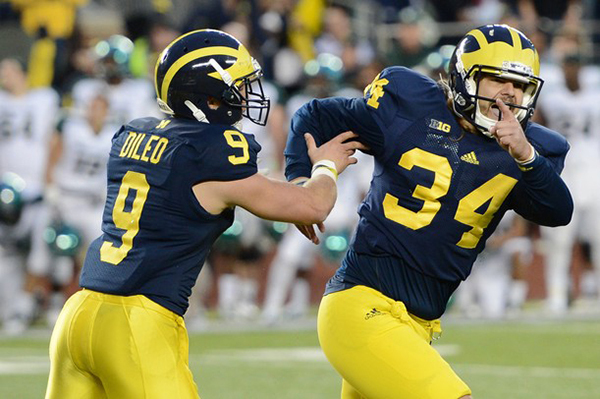 And Dileo did exactly what he's always done at Michigan: catch absolutely everything thrown his way. I'll have to rewatch the game to see how he got so open on the final play, but that may be a season-defining catch. The dropped touchdown pass by Gallon was unfortunate and I think it was caused by a miscommunication between Gallon and Denard. I'm giving Denard the benefit of the doubt here, but I think he was expecting Gallon to settle down in the zone where Denard threw the pass. That may not be the case--there's a good chance Denard just made a bad throw--but regardless, that catch needs to be made. Speaking of dropped passes, someone please teach Devin Gardner how to catch in traffic. Taylor Lewan is desperately trying to convince everyone that he's not an All-American left tackle. He needs to get these penalties in check and sort out his blocking protections because he's been disappointing this season. The only way this benefits Michigan is if it forces him to return for his senior season. Will Gholston may need to stick around for his senior season to erase his reputation against Michigan as a total non-factor. Denard's rushing totals take a major hit in this game, but Toussaint finally finds some lanes to run through. MSU understands the threat of Denard's legs and have probably gamplanned to stay home on him on all option plays. There will be a fumble generated on a linebacker blitz against an option play. Also, we'll see the return of Denard's back-foot heaves that end serendipitously, mostly thrown to Devin Gardner who makes a few astonishing catches in traffic. On the other side of the ball, MSU won't be able to get rolling all game. Michigan's linebackers completely shut down Bell who averages ~3 YPC. Maxwell, meanwhile, will have a higher completion percentage than you'd expect but also throws two costly interceptions. Denard's rushing totals were down a bit but Toussaint still couldn't get things rolling. No fumbles or backfoot throws. MSU couldn't get started, though, save two second-half drives. Bell averaged 2.6 YPC and Maxwell threw a really costly interception. Saturday's game against Nebraska will probably determine who wins the Legends division. Beating Nebraska puts Michigan two games ahead of everyone in the division save Terrible Iowa, who has been unexpectedly competent. Nebraska is 12th in points per game but 72nd in points against. Given how Michigan has fared against rushing attacks the last three weeks, Nebraska shouldn't be too much trouble, but they have the potential to beat the Wolverines, especially at night in Lincoln. Good analysis on the 1st and 2nd down play calling. While it is run heavy, upon a second look at the game I'm OK with Borges play calling. We knew MSU's offense was not going to do much against UM's D so the coaches played it close to the vest. Really, only UM TOs were going to cost UM the game (see ND game). We tested that theory big time by not executing in the red zone a couple times but I think that is on Denard. If you look at his feet on his throw to gallon they are almost perpendicular to the route hence he throws behind him. This was right after he threw a bad fade to Funchess in the corner. If underthrows it thats 6. Instead it was to the inside and turned into a good pass break-up for Funchess. Denard also missed countless check-downs to the RBs and short throws that could have kept the chains moving on a lot of our drives. Keeping Denard at or below 30 PA's is a good recipe for sucess in my book. Sure the running could have been better, I would have liked to see more misdirection in the running game but thats another story to be had. I was also OK with Borges' playcalling. The analysis of run/pass calls is good as far as it goes, but is only one piece of a much more complex decision process. I think that different people will draw different conclusions based on their own preconceptions of Borges. If he switches away from the run then the complaint is that he is going away from Denard's strength and/or allowing the defense to dictate the offensive strategy. Certainly the offense was not crisp and effective, but I don't think that there is such an obvious or easy answer in the play calling that would have made a dramatic improvement in the offense. Moreover, lets accept as a given that whatever else he is, Al Borges is a reasonably intelligent professional with 25 years of coaching experience and a whole coaching staff backing him up. If there were something so obvious that a bunch of amateurs picked it up, I am pretty sure they noted it too and had a reason for doing it. We may disagree with (or not understand) the reason, or their reason may not have worked out, but lets not pretend that they do not know what they are doing (or describe it as "incoherent").